Windows 2012 RRAS IPsec VPN does not support NAT-T out-of-the-box. By default, RRAS only works with public IP addresses -no NAT. Windows 10 clients cannot connect with L2TP from outside the office. Windows 2016 does not support L2TP for any client from behind routers running NAT. Enable NAT-T on both Windows servers and the clients. NAT-T allows the VPN server to serve clients (e.g., Windows 10, Android, Apple iOS) from behind the NAT device. Modify MTU. IPsec uses Encapsulating Security Payload (ESP) to encrypt packet headers and payloads. By default, ESP is not compatible with Port Address Translation (PAT). This is because TCP uses ports and ESP does not. TCP and ESP are different Internet protocols. TCP uses protocol number 6. N.B., TCP protocol number 6 is not the same thing as TCP port 6. TCP ports are communication endpoints. For example, TCP uses port 80 for web traffic. ESP uses protocol (i.e., not port) number 50. ESP is a protocol without ports. Network Address Translation (NAT) uses port translation PAT to bind traffic flows with internal hosts. Therefore, ESP does not work with NAT. NAT-T allows ESP to work from behind NAT. It encapsulates ESP protocol 50 inside User Datagram Protocol (UDP) 4500. N.B, NAT-T is not the same as IPsec over UDP. NAT-T is enabled on most operating systems (e.g., Android) -Windows is the exception. Fortunately, we can enable NAT-T on Windows 10 and Windows 2012 with a few simple changes. Windows IPsec clients are supposed to work from any location. Therefore, only enable NAT-T on the 2012 RRAS server. Create a new registry key to enable NAT-T. These changes will fix those pesky L2TP-NAT problem. Make sure clients use the latest edition of Windows 10. Early versions had quirks where clients simply would not connect via NAT-T.
NAT-T works great with the registry fix and Creators Update. Some folks had to toggle the NAT-T registry value in order to connect (http://bit.ly/2r2CKnF). I assume this fix was for the November or Anniversary Update. S4B Clients on Split-Tunnel VPNs. Skype for Business (S4B) and Lync clients may experience problems when traversing a split-tunnel VPN. Use Name Resolution Policy Table (NRPT) and Windows firewall group policies (GPOs) to bypass split-tunnel VPNs. This solution is easy to administer and provides remote offices the best multimedia experience. Local S4B/ Lync clients cannot host conference calls for external clients. All clients (external and DCA) can connect to conference calls hosted at at the company headquarters (JFK). Local S4B/ Lync clients cannot share multimedia content (e.g., screen-sharing, video, etc.) between external clients. All clients can share multimedia content when connected to conference calls hosted at JFK HQ. Audio and video quality is poor (e.g., choppy or static) between DCA and JFK locations. This business consists of two locations: JFK is the primary HQ office. DCA is the branch office. A site-to-site IPsec VPN tunnel connects the DCA and JFK offices. DCA uses split-tunneling to forward all corporate data. DCA uses its default gateway to forward all other traffic to the Internet. JKF hosts all Lync servers: Front End, Access Edge, and Reverse Proxy servers. Both DCA and JFK use Active Directory (AD) integrated DNS servers. External clients allow staff to work from home. Figure 1. Example of Lync and organization topology. S4B-Lync uses network topology to select the best connection path. It uses a peer-to-peer connection framework called Interactive Connectivity Establishment (ICE). This framework includes Session Traversal Utilities for NAT (STUN) and Traversal Using Relay NAT (TURN) protocols. STUN identifies client Network Address Translation (NAT) (i.e., private IPs). This process also identifies the default gateway (i.e., public IP). Multimedia travels directly between end-points when STUN is used. S4B/ Lync clients prefer to communicate directly (i.e., peer-to-peer) between clients which reside on the same LAN. N.B., LAN is not a reference for broadcast domains. LAN, in this situation, includes all internal networks (i.e., subnets) with routes to the Front-End subnet. Internal clients never use the Access Edge server for internal communication. Similarly, external clients prefer STUN for communicating multimedia content to other external peers. The Access Edge server will only bridge external-to-external clients (i.e., TURN) if peer-to-peer communication is not possible. Lync clients use TURN framework when end-points do not share a common LAN. The TURN process creates dynamic ports on the Access Edge server; and in turn (pun), proxies external multimedia. TURN is similar to Port Address Translation (PAT), just as the Access Edge server is similar to an Internet gateway. To recap, S4B/ Lync clients prefer direct peer-to-peer multimedia communication. Internal clients will never use the Access Edge server for internal multimedia communication. External clients use the Access Edge server to bridge communication whenever peer-to-peer communication is unavailable; including external-to-external, and external-to-internal. ICE framework (generally) provides the best multimedia experience. However, it does not work well over split-tunnel VPNs. Split-tunnel VPNs create STUN and TURN mismatches. For example, the DCA branch office firewall forwards all domain traffic to the JFK primary office; all other traffic forwards out the local gateway (i.e., Internet). DCA and external Lync clients interpret this topology differently (Table 1). Notes: DCA uses split-tunnel VPN to connect to JKF. Stun represents Lync client-to-client. TURN represents multimedia proxy (i.e., Lync Access-Edge) requirement. Blue represents split-tunnel topology. Red represents client topology mismatch. The primary problem with split-tunnel VPNs is with how the S4B/ Lync client interprets the topology. Recall, internal clients always use the Access Edge server for external communication. Likewise, internal clients never use the Access Edge for internal conversations. The VPN firewall forwards all domain traffic to the JKF network. Therefore, DCA clients consider themselves as internal; and external clients as external. DCA clients will only use the Access Edge server when communicating with external clients. External clients have an entirely different interpretation of the topology. External clients are aware of the DCA Internet gateway, but they remain unaware of its split-tunneling. External clients will therefore interpret DCA clients as external peers; multimedia traffic is sent directly to the DCA clients (i.e., STUN). To recap, external clients are unaware of the DCA split-tunnel. These external clients attempt to send audio and video (AV), and expect to receive AV, directly from the DCA clients. Whereas DCA clients send AV, and expect to receive AV, proxied from the Access Edge server. Figure 2. Lync directional mismatch. The split-tunnel VPN causes a secondary problem between JFK and DCA. These clients use STUN to establish peer-to-peer connections across the VPN. Users complain about overall client AV quality between these locations. Multiple layers of encryption decreases overall AV quality. Lync encrypts multimedia packets with TLS and SRTP protocols. The VPN adds additional packet overhead as it encrypts and encapsulates each packet. Staff at both locations can expect better AV if DCA S4B-Lync clients bypass split-tunneling (i.e., TURN). Figure 3. Bypass the split-tunnel VPN. S4B-Lync clients can bypass split-tunneling entirely: (a) changes to DNS topology; and (b) changes to client firewalls. Recall, both offices belong to a single AD domain, and each office uses recursive AD integrated DNS servers. AD replication ensures internal name resolution is the same at each location. Lync clients use DNS to locate S4B-Lync servers via S4B-Lync Discovery (Table 2). Notes: Discovery preference assumes organization uses a split-brain DNS topology. Topology consists of independent internal and external DNS servers. All internal clients, including those on the VPN, use internal DNS for Lync Discovery resolution. External clients use external DNS for their Lync Discovery process. Therefore, VPN clients can bypass split-tunneling using a process that distinguishes Lync traffic, and resolves it using external name records. N.B., Internal DNS continues to resolve all other (i.e., non-Lync) requests. Otherwise, what's the point of having a VPN? Split-brain DNS requires a confusing array of zone records. Most Internet documentation suggests pin-point DNS zones to influence Lync traffic. Instead, consider using NRPT, which simplifies the entire domain resolution process. Forward all domain name requests for Lync services to external DNS servers. Use client DNS settings (i.e. internal) for all other DNS resolution. Create new GPO: Computer Configuration → Policies → Windows Settings → Name Resolution Policy. Figure 4. NTRP GPO to bypass split-tunneling. Change the Query Resolution settings. Enable "Configure query resolution options". Enable Resolve both IPv4 and IPv6 addresses for names. 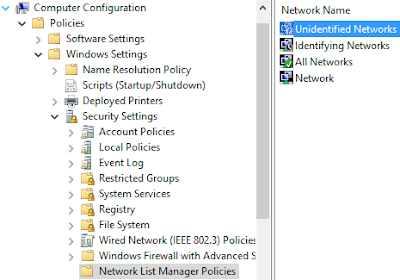 Create rules that forward Lync FQDNs to external DNS servers. a. To which part of the namespace does this rule apply? Choose FQDN. b. Click on the Generic DNS Server tab. e. DNS server: Enter an external recursive DNS server; or the authoritative public (i.e., Internet facing) DNS server for your organization's sip-domain. GPOs are applied to AD domains, sites, or Organizational Units (OUs). In most situations, it makes sense to apply the NRPT GPO to the AD site that correlates with the branch office. From Group Policy Management: Right click on Sites → Left click on Show Sites → Right click on the branch office site → Link an Existing GPO. Alternately, create separate computer OUs per location. Link the NRPT GPO OU that nests all branch office computers. Restrict traffic based on application (i.e., S4B). Restrict traffic based on source (i.e., DCA) and destination (i.e., JFK). Create new GPO: Computer Configuration → Policies → Windows Settings → Security Settings → Windows Firewall with Advanced Security → Inbound Rules. Right click on Inbound Rules → New Inbound Rule → Program → Path: %ProgramFiles%\Microsoft Office\Office15\lync.exe → Block the Connection → Apply rule to Domain. N.B, Use applicable application paths. For example, Lync Basic and Lync Professional may use different paths. Edit the new Inbound Rule: Right click on the new rule → Click on the Scope tab → Add all internal IP subnets (i.e., primary office) to the Remote IP address field → Click Add → Click OK. Figure 5. Windows Firewall GPO to bypass VPN. Apply the newly created Firewall GPO to apply the AD site that correlates with the branch office. Alternately, apply this GPO to OU that nests branch office computers. NRTP and firewall GPOs force S4B-Lync clients to bypass split-tunnel VPNs. These combined GPOs have two primary effects: (a) DCA-to-external clients prefer STUN (i.e., client-to-client); and (b) DCA-to-JFK clients use TURN (i.e., client-to-Access Edge) for external AV communication (Table 3). Notes: DCA uses split-tunnel VPN to connect to JKF. Stun represents Lync client-to-client. TURN represents multimedia proxy (i.e., Lync Access-Edge) requirement. Blue emphasizes branch office traffic. Problem: How to auto-config RemoteApp webfeed on Thin PC. Launch Registry Editor with regedit. Create a new key in the above hive: Name the key: Workspaces. Create a new key in the newly created Workspaces hive. Name the key: ResourceType. Create a domain security group that manages local administrators. This process allows domain users (i.e., non-domain administrators) to administer computers. System Administrators log onto workstations and servers with their domain admin account. Casual use of domain administrator accounts put the entire organization at risk of compromise from malware, keyloggers, and hash attacks. Additionally, attackers may compromise services or scheduled tasks run with local system privileges. This can provide a foothold that compromises the system. Prevents network administrators from using their Domain Admin accounts for general purposes. Implement a general purpose administrative account. Create new security group in AD. This group will be used to manage computers. Add domain users to this group as needed. Right click on Restricted Groups. Left click on Add Group. Members of this group (i.e., domain group): New AD security group created in Step 1. The Group is a member of (i.e., local group): This is the local security group for each workstation (e.g., Administrators). 4. Assign new GPO to AD OU. Wait for change to propagate. No more unnecessary use of domain admin accounts. That's It! Fix: "The trust relationship between this workstation and the primary domain failed"
Error: "The trust relationship between this workstation and the primary domain failed". Background: Domain logon fails because the computer password is outdated. The machine password updates every 30 days. This problem occurs when adding a computer to the domain with the same name, or restoring a computer from backup (e.g., VM snapshot). Solution: First and foremost, ensure computers have a local Administrator account and password before this problem occurs! Create a unique (i.e., new) administrator account and password for each computer. Disable the default local "administrator" account. Netdom is not available with every version of Windows. Standard with Windows 2008 R2. Install Netdom on Windows 7 with the Remote Server Administration Tools (RSTAT). Note: "-Server" represents the local domain controller. Control Panel > System > Computer Name > Change settings > Add computer to a workgroup > Restart > Repeat process and add computer to the domain.